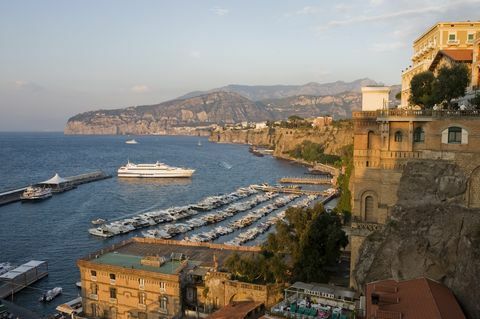 The splendid coastline of Sorrento has a rugged coastline, small bays and rocky baths. An exception is the small town of Meta di Sorrento. 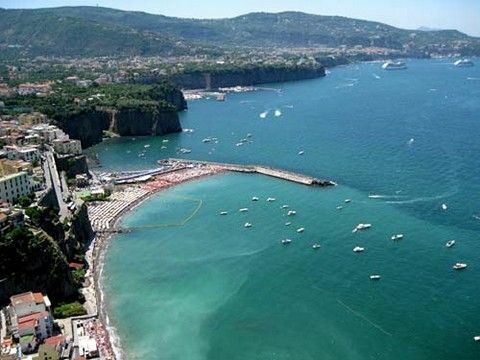 It is known for the longest sandy beach on the Sorrento Coast. After a sightseeing tour you can relax there with a view of Mount Vesuvius. An excursion to the beach of Meta di Sorrento is ideal to relax from the sightseeing of the numerous sites on the Bay of Naples. The Sorrento coast is mainly characterized by steep coastlines, but the small town of Meta has a beautiful sandy beach. 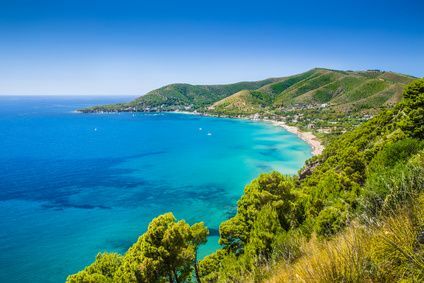 It is divided into two sections: Marina di Alimuri and the beach of Meta. In addition to the beach bars with restaurants, bars and deckchairs, you can also stretch your towels on free sections. On the panorama photo you can see the beach of Meta. 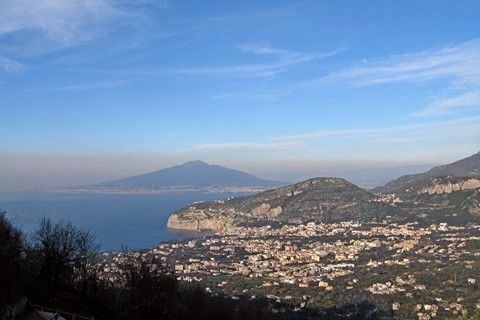 It is located behind the neighbour village of Piano di Sorrento. In the distance there are some ships that approach the beautiful port of Sorrento, the most famous touristic town on the coast. From Sorrento you can reach the island of Capri by ferry (see also informations about ferries). The four star Hotel Alimuri Spa has a wellness center and a great panorama view. It is located directly on the Alimuri beach, with a swimming pool and a restaurant. In the evening you can enjoy a wonderful time in the piano bar. How to get to Meta di Sorrento? You can reach Meta in less than an hour from the Garibaldi railway station in Naples by the Circumvesuviana regional train (direction Sorrento). From Meta train station, the beach is only about one kilometer away.